I have always had bad skin, spots and acne scaring and a greasy and blotchy complexion. I felt embarrassed of my complexion so much that I had spent so much money on different skin treatments, products and makeups all of which did not work. There would be times that I wouldn’t even leave the house due to my outbreaks (which at the age of 30 was ridiculous). My confidence would be so low at times and I would be really fed up with not being able to find a cure for my problem skin. When I started working at Smile Design by Ash I couldn’t wait to speak with Frances to see if she could help me. During my consultation Frances listened to my ongoing skin problems with a sympathetic ear and gave me some guidance on different products and makeups that she recommended along with treatments that she suggested to help. The first course of treatment Frances recommended was a course of glycolic peels. I was apprehensive as I have had a lot of different skin treatments in the past that just didn’t work, but I took her professional advice and scheduled in for my first peel. At my first appointment I was feeling a little nervous as I had seen “Acid” peels on different TV programs and saw that they could be uncomfortable and have a long healing process, BUT there was no need, Frances’s professional, caring and gentle approach calmed my nerves straight away. The treatment was comfortable (maybe a little itchy for a few seconds), my face was a little red but went back to normal after a few hours. The following morning I couldn’t believe the results, I could see a massive difference (and that was just after one peel), my scarring had near enough gone and my complexion was glowing. There was no scabbing as you see on the TV, I couldn’t wait to have my next peel!!! – 6 weeks later I had my next one, again the treatment was totally comfortable and the results just kept coming. I had a course of 6 peels over about 7 months. It’s now a year or so after I have had my treatment and my skin is wonderful, I can go out without foundation on which I have never been able to do. I have a new found confidence and actually have people comment on how nice my complexion is. I actually feel pretty without having to cover my face in lots of makeup. Finally I had sorted out my skin problems so I then moved on to see if I could have some anti- ageing treatments. I had a few wrinkles appearing on my forehead and around my eyes and asked Frances how she could help. 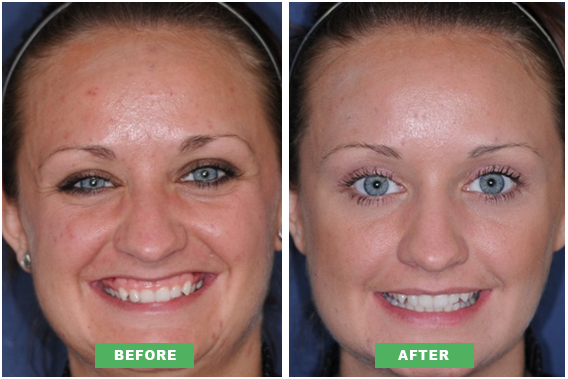 She recommended a course of 3 derma rollers and some muscle relaxing treatments. The combination of these two treatments were amazing, they plumped up my skin smoothing out my fine lines and wrinkles and helped give me a younger looking appearance. I have yet to have someone guess my true age which is every girl’s dream. I can’t thank Frances enough for the new lease of life she has given me, I am so much more confident and happy since having my treatments and still can’t believe the difference it has made.